The way consumer goods are purchased has quickly shifted from almost entirely in-person to almost entirely online. This presents a problem for products that rely on impulse buys at the checkout line, such as gum. For the folks at Wrigley, this change in the marketplace presents a challenge, and it’s that challenge that they asked Broad’s Full-Time MBA students to attempt to solve as part of Extreme Green – Building Creative Confidence, a short course designed to build creative and innovative thinking. Winners from the Extreme Green – Building Creative Confidence course, Shruti Gupta, Tess Moreno, Marc Palazzolo, Christopher Storey, and Marc Wilson pose with Glenn Omura, associate dean for MBA and professional master’s programs, Professor Liz Bain and representatives from Wrigley. 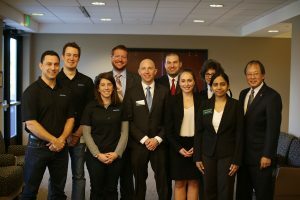 Executives from Wrigley’s 5 Gum challenged the MBA class of 2017 to a case competition with the above situation and visited campus to hear presentations of solutions from 15 teams of students. “The Wrigley team was most impressed by the analysis of the consumer journey presented by the winning team of Shruti Gupta, Tess Moreno, Marc Palazzolo, Christopher Storey, and Marc Wilson, who proposed a self-monitoring cell phone app that ‘knew’ when to suggest a gum purchase and facilitate an online purchase,” said Glenn Omura, associate dean for MBA and professional master’s programs. The runner up team of Melody Buckley, Tyler Duston, Anita Hariharan, Yuxi Wei, and Nicholas Zaggy offered a way of changing consumer behavior from impulse to habitual purchasing. The third place team of Weian Huang, Ankit Jain, Joshua McAlary, Andrea Schweitzer, and Brent Walker suggested embedding packs of 5 Gum in the Candy Crush video game. The student teams had to understand current macro trends, project them ten years into the future, and imagine what technologies might be easily accessible for business and consumer use, while drawing insights on what consumer purchasing behavior might be like and developing a futuristic perspective of what could be, Omura said. The presentations represented the integrated efforts of three different classes: Extreme Green – Building Creative Confidence; Marketing Strategy Execution; and Management Communications. “It was highly rewarding to see the content of what was taught in class get integrated in the students’ strategies, but most exciting was seeing the creative ideas that I would never have thought of,” Omura said. Chris Anders, R&D global program manager at Mars, told the class the presentations reflected the kind of students Wrigley and Mars are looking to hire. “I love these proposals. These proposals fit the mold perfectly,” he said. Extreme Green – Building Creative Confidence taught students that creativity can be reawakened and applied to solve business problems. Marketing Strategy Implementation followed up by teaching how to use creativity to find problems others do not yet perceive and solutions beyond the imagination of most. Management Communications taught them how to present the ideas with energy and purpose.